True to its name, the 'Alluring Chest' is alluring in terms of its look and feel. The Evergreen Woody Tea Chest is an elegant tea gift box for someone who is a tea lover. The perfectly crafted black matte wooden box is eco-friendly and great way to organize your carefully chosen flavoured gift teabags. 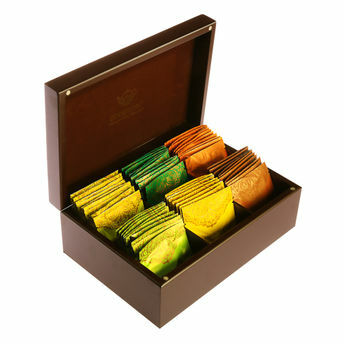 Alluring Chest tea box with luxurious finish is perfect for every occasion. Flavours included are Darjeeling Tea, English Breakfast, Green Tea, Jasmine Green Tea, Kashmiri Kahwa, Peppermint Tea.